These no-bake lemon truffles are bursting with fresh-squeezed flavor! 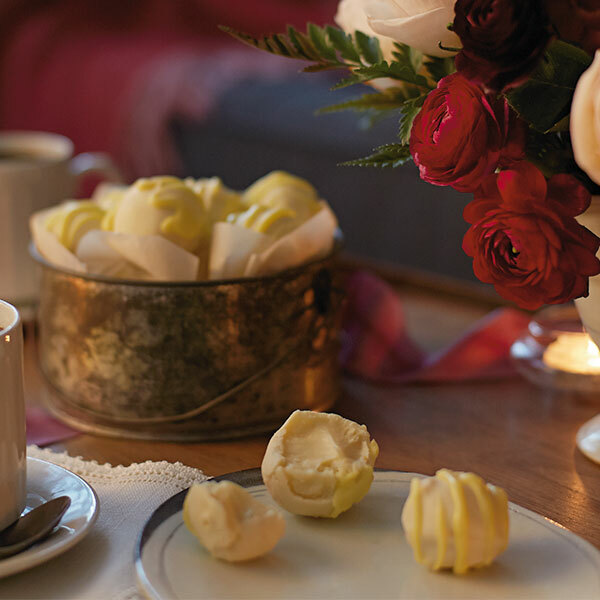 Made with just 3 ingredients—heavy cream, lemon zest and white chocolate—this easy lemon truffle recipe creates a rich and refreshingly different dessert you're sure to love. Top these sweet and simple truffles with our luscious lemon glaze for even more citrusy goodness. Heat heavy cream to a simmer, and stir in 8 ounces white chocolate and lemon zest. Remove from heat and stir until chocolate is melted. Chill until firm enough to mold into 1-inch balls. Freeze truffles for 1 hour. Place a cooling rack over a sheet pan lined with parchment paper. Heat remaining 8 ounces chocolate in a microwaveable bowl in the microwave for 1 minute. Stir until smooth. Using 2 spoons, roll each truffle ball in melted chocolate and move to cooling rack. While chocolate is setting, prepare lemon glaze. Mix together lemon juice, powdered sugar and food coloring. Mix until smooth. Drizzle each truffle with lemon glaze. Allow truffles to set for 30 minutes before serving.